What if finding love had nothing to do with swiping? A project that highlights the importance of re-imagining dating apps by proposing speculative possibilities that pushes designers to think in a non linear way in this technologically-saturated landscape. Undertaken as a six month long thesis project this research and speculative design project evolved greatly. Focusing on dating apps as a funnel the project aimed to bring to light certain trends and theories that characterised the way the internet and digital applications were used by designers, and to question that linear approach. In the objectives of the study I have stated ‘the designer’ as the stakeholder with the intention of informing the study with the perspective of graphic designers, speculative designers, design researchers. Designers and technologists contribute to ‘social engineering’, thus they must be aware of the implications of what they create. (Lanier, 2010). It also for the purpose of the study to cease from becoming a general enquiry on connective apps, and one that is more focused on design and design management. The primary research for the project started while reading books by eminent psychologists, sociologists and technologists who have written about how technology changes the fabric of human interaction including Sherry Turkle, Jaron Lanier, Daniel Kaheman and Marshall Mcluhan to name a few. The initial broader enquiry from the literature review led to exploring the idea of a non linear approach to technology by interviewing designers and researchers who work with concepts like re imagining the Internet, and alternative paradigms of design, the ethical outcomes of design in Western Culture. The insights arrived at, where carried forward in into the primary interviews centred conducted with speculative designer Ted Hunt, co founder of Internet Age Media Andreas Colmenaras and writer, designer and the maker of the documentary ‘Ethics for Design’ Gauthier Roussilhe. In the current socio cultural scenario in countries like the UK, convenience surpasses authenticity. As designers they must be critical of the tools (technologies) they use as they shape human behaviour. It was necessary to challenge the status quo of digital technologies like connective apps where it is often assumed that human nature is ‘rational’. Designers and technologists were becoming aware of the importance of practicing ethical design and using tools like documentaries, web resources, books to start a dialogue about its importance. The externalities of design like addiction to the act of swiping, superficial connections due to the interface of the app - how it was more of a ‘matching app’ rather than a ‘dating app’ was something that they thought needed to be re imagined through alternative design thinking. Based on the insight on the externalities factor I worked on an ‘intended use v/s by product of use’ interface map to illustrate how the secondary uses or ‘by products’ of connective apps are caused due to the way the interface is designed. There was a need to question this standardised interface which is common to everyone ‘swiping’ on the app. Thus the proposed speculative research outcome/ recommendation was a platform for graphic and UI/UX designers to re - think the elements that go into designing connective apps - the gestures it provokes and normalises, the interface that reduces complexity and empathy and a set of questions to consider the implications of what they create. You can view the platform here. 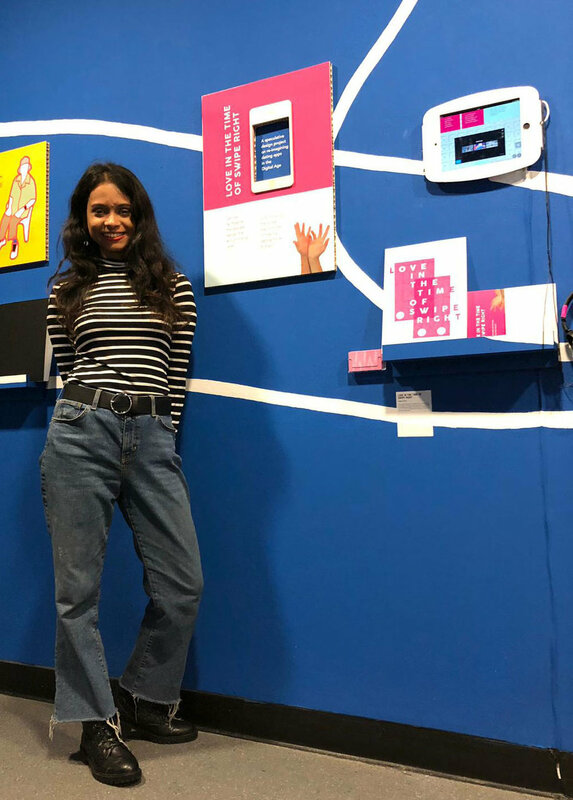 ‘Love in the time of Swipe Right’ was exhibited as part of the London College of Communication Post Grad Shows 2018. This project is an ongoing exploration of why it is important to examine and re look at the way we use design to create binary answers for complex human emotion. I hope to collaborate on workshops, think tanks with other designers/ technologists/ sociologists on exploring this realm of research concerned with the importance of ethical design with regards to technological trends.